Some skins have a predefined font, others inherit the font of the page. You can read more in the Fonts article. 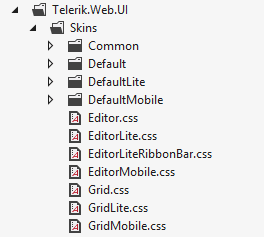 The Hay, Forest, Sitefinity and Transparent skins are obsolete and have been removed from the Telerik.Web.UI.Skins.dll assembly as of Q1 2014. You can find more information on the matter in this blog post. Telerik.Web.UI.RadSlider with ID='RadSlider1' was unable to find embedded skin with name 'MySkin'. Please, make sure that you spelled the skin name correctly, or if you want to use a custom skin, set EnableEmbeddedSkins = false. It is possible to create a custom skin by taking an embedded one and making various adjustments. The non-embedded versions of the built-in skins are provided in the 'Skins' folder of the Telerik® UI for ASP.NET AJAX install location. One can pick any skin for any control and modify some CSS rules. Then the modified custom skin must be added to the website, the EnableEmbeddedSkins property of the control must be set to false and the modified CSS file must be manually registered in the ASPX page (or user control). If you do not want a predefined skin for a control, set its EnableEmbeddedSkins property to "false". Usually, a Telerik control has some collection of CSS styles, which should be applied regardless of the used skin (either built-in or custom). Such common CSS styles are included and registered on the page in a base stylesheet. If you want to disable this automatic registration, set EnableEmbeddedBaseStylesheet to false. Telerik supports three Render Modes: Classic, Lightweight and Mobile. If you do not specify a Render Mode in your web.config file or in the control configuration, the RadDeviceDetectionFramework specifies the Render Mode that will be sent to the browser. In older browsers it will resolve to Classic mode, in newer browsers to Lightweight, and when the requesting browser is a mobile browser—to Mobile. If the browser is modern but the concrete control does not support a Lightweight mode, it will fallback to the Classic mode. The same applies with Mobile—if the control does not support it, it will fallback to LightWeight, and then to Classic (if LightWeight is also not supported). If you explicitly set the RenderMode of a control to Lightweight, for example, it will not use the Mobile mode, even when the requesting browser comes from a mobile device. The CSS files are named in the following manner: [Control]. [Skin].css e.g., Slider.Glow.css. The images are stored in a folder named after the control. Each Render Mode of a control has its own rendering and, therefore, the base stylesheet and the skin-specific stylesheet it requires are different from those used for the other Render Modes. To reduce the footprint of the controls, each skin mode is kept in a separate folder and is only sent when needed. When customizing a built-in skin, you should use the folder according to the Render Mode you will be using. 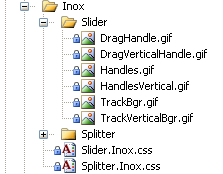 The Render Mode-specific folders have the following structure: [Skin Name][RenderMode]. For example, SilkLite (for the Lightweight Render Mode) and SilkMobile (for the Mobile Render Mode) are the two sibling folders next to the Silk folder. Figure 2 and Figure 3 show the basic file structure and location of a skin with its Render Mode-specific variations. For brevity, only files related to RadGrid and RadEditor are shown. A full-blown skin will contain the full control list according to the supported render modes. Figure 3 shows a collapsed structure of the Default skin and its Render Mode variations as well. If you set RenderMode to Auto, you will need to devise an approach that will detect the requesting browser (e.g., by using the RadDeviceDetectionFramework) and register the appropriate customized stylesheets.